The decision to undermine the Iran nuclear deal was sadly but another, albeit momentous, act of destruction of American and global security. It is apiece with several other actions by Trump that are acts of destruction of key frameworks that support security, peace, justice and prosperity for our nation and for our entire earth and the people who share our fragile planet with us. That is how many European citizens and leaders are feeling and it undermines a global framework of cooperation and peace. In the case of the Trump unbelievable and stupid Iran deal rejection he is also making unhinged belligerent words and actions towards North Korea. It all looks like he is looking for war so as to deflect the move towards the dangers to him and his presidency of revelations and possible indictments of deals with Russia and obstruction of justice or simply his hate of all that is good. Many of his military advisors and civilian cabinet members have all said that the Iran nuclear deal is in American security interests, yet he seems to have chosen the likely path of catastrophic war in both cases. In Europe there is near total agreement that the Nuclear deal is good for global security, has been adhered to by Iran, and the alternative is for possible immediate action by Iran to renounce the deal and start the move we to build its nuclear program without much limits. Contrary to some right-wing writers some real restrictions continue beyond the 10 years set by the Iran nuclear deal. Fortunately, America can’t unilaterally dissolve the deal since our European allies, EU, Russia and China support it. Europeans look in horror also at the reality that no agreements made now by America can be trusted. Those on the street and others in Berlin that I talked to are truly frightened by what they see in Trump’s actions which are totally contrary to American values and destabilizing of global peace. Now it is up to the American Congress to act to either do Trump’s cruel bidding to destroy an agreement on which there is almost total support even by some that opposed it originally, or to keep our word and not vote for withdrawal but agreeing to Trump’s demand of imposing new sanctions when none are called for and which the Europeans can and will ignore. We should work via diplomacy on the outstanding issues we have with Iran. That has a much better chance to getting results than blind anger and the cost of war. We all need now to fight for that outcome as the alternative is mutual catastrophic harm for all. TRUMP AND A NUCLEAR NORTH KOREA AND THE LARGER STRATEGIC PICTURE. After the statements about what Trump might do to North Korea if it does not stand down on its nuclear weapon programs, there seems to be a great debate about Donald Trump’s foreign policy strategy and even if there is one. As with his missile strakes on Syrian the question is what is next and is there any strategic vision or even reflection? As best we can discern is it remains just based on “transactional” and “intuitive” feelings. We need to remember this is the man who said he knew more than the generals and who is cutting by about 30% our diplomacy and global assistance budget. Among the key issues we face we still do not have a clue what ends he want including dealing with China, confronting North Korean nuclear ambitions, fixing the middle East conflicts, keeping our alliances intact, and dealing with Putin’s Russia. We do know that on climate change he has cut the budget for almost all US programs in to address this existential and disastrous reality. He would take us out of the Paris Accord the only effective instrument we have to gain global cooperation. An editorial in the New York Times on May 17th entitled “Mr. Trump’s lose talk on Korea” noted that Trump’s approach is more likely to endanger some peaceful solution than solve peaceably the conflict with North Korea. There is real reason to question where are we going with this and to what end? Surely at some point the leaders of China, North Korea and America must recognize in this option for an aggressive “game” the only end is destruction of all sides This is the worst case outcome when in reality there is a “win-win” outcome if only we all can recognize the harsh reality of nuclear conflict. There should be a point where all sides can accept gains for all sides with a diplomatic solution where Kim Jong Un, president, Xi Jinping, and Donald Trump control their fears and their egos. Any leader must look closely at the risks of mistakes and stupidity by the other.. The path of a better outcome is North Korea gains a de-nuclearize North and South Korea, food to feed his people. China gains added stability and security on its borders and eliminates the danger of a war that would be a total disaster for it and removal of nuclear weapons North and South. America gets rid of a nuclear threat to allies like Japan and South Korea and not least to America. Trump gets to enlarge his ego. There seems to be no act by Donald Trump that does not endanger American and global security. We had the undermining of the EU and NATO, the beating up on America’s allies, and the threat to tear up the Iran nuclear and not least the still unknown relationship between Trump and Putin with overtones of selling out to Putin and rewarding him for helping in Trump’s election. But in the most recent words by Trump in an interview Thursday, he said he thought an arms control treaty with Russia is a “bad deal” and that the United States should build up its nuclear arsenal to be the “top of the pack.” This, is my top pick of dangerous acts by this clearly clueless man on issues of war and nuclear matters. As every knowledgeable person knows the American nuclear arsenal and capability tops that of any other nation on this earth and has for a long time. Our nuclear weapons can destroy much of the world almost instantaneously. Much of that nuclear capability is deployed in essentially invulnerable American ballistic missile submarines. That is why there is no reason for us to add to them or try to “modernize nukes” them beyond basic maintenance and safekeeping. Contrary to Trump’s call for added military expenditure just adds to the overwhelming resources and war fighting capability we already have over either Russia or China. Any conflict with them would be as they use to say MAD –mutual assured destruction. That means they should never be used in any circumstance and their existence is purely as deterrence. American experts and our allies know that a new arms race would not be to the interest of any nation either friend or potential foe. But now both Russia under Putin and Trump seem to not understand the importance to our security of past and present arms control treaties and agreements. The last was the New START treaty between America and Russia which capped the number of nuclear warheads by both nations. And under the Non-proliferation Treaty we and other nuclear nations are bound and promised to work toward elimination of these weapons. The treaty’s aim by this promise is to stop other nations from building their own nuclear weapons. Top leaders, Secretaries of State and Defense, etc. with great experience on nuclear issues, Republicans and Democrats have called for their eventual and timely elimination, known as “going to zero.” A worthy cause but requires all to moderate their own ambitions and work very hard on a true mutual reduction accompanied by other safeguards to ensure security for all nations. US and Russian escalation of these weapons would undermine greatly the incentive of others to forgo their own weapons. Trump’s words and actions so far have only given other nation reasons to be frightened, uncertain of our support, or go alone in developing these weapons. The end being a world of chaos and destruction which Trump for some reason seems to relish. What is at work in Trump mind or his real goals? Is it an initiative, not of gaining good and fair arms control agreements and seeking confidence building measures bringing security for the world population that make us all safer, or is it Trump’s chaos theory at work of unlimited and high risk blindness to an “arms race” that itself is massively dangerous? What is needed is less such weapons, better training and practical equipment to ensure American defense, support of our allies, and safety of our people in the world we have today. We need not more money in weapons with no purpose in our time but the near elimination of humanity and global civilization. Trump in this field has continue his exaggerations and reinforced his habitual lies in claiming the U.S. has “fallen behind on nuclear weapon capacity.” There is NO nation on earth that can match America’s modern nuclear force or for that matter conventional war fighting and the safeguarding of our nation. To say otherwise is to deceive out people, waste our needed resources for building back our civilian infrastructure, ensuring our children get the best education in the world, and protecting our environment, not least addressing the massive threat of climate change. We welcome your comments!! See section below for your comments. 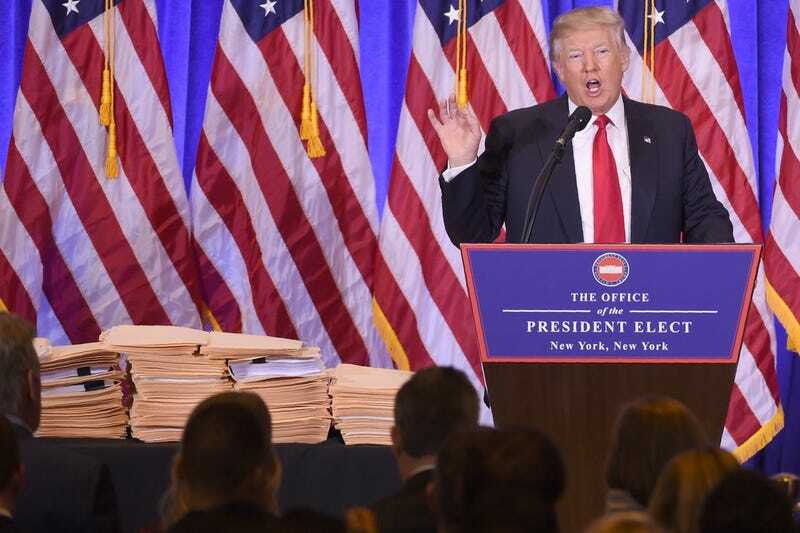 THE SHAMBLES OF TRUMPS PRESS CONFERENCE: WHAT DOES IT PORTEND? The Trump press conference today was a shambles for both Trump and honesty and transparency in politics. His main target seemed to be the press and the intelligence community. Part of the conference was spent trying to put aside any criticism of self-dealing. However, with his family still in total control of his assets and the Trump Organization, the President-Elect will continue to face criticism and lingering questions about conflicts of interest. Trump also declared his company would not make any more “significant” foreign deals, but the tone and substance of these decisions would give an informed citizen a deep concern for our nation’s direction if closely examined. He took on, as expected, the intelligence community on the leaked reports that alleged Russia had personal dirt on him. Trump made his anger clear and seemed to threaten the intelligence community. He denied that the report was leaked by his staff and painted it as the work of his political opponents. He said his intelligence community appointees would provide a report on foreign hacking but did not address the deeper question of his relationship with these agencies once president. But from what he did say, and what he implied, that relationship will be strained. This is then likely to be a weak point for our larger security strategy as an ignorant president will be uninformed of vital realities in our complex and conflict filled world by agencies with which he is in open conflict. He would not answer the question if any of his staff or family had any contact with the Russian authorities during the campaign or after the election. Regarding Russia and Putin, he acknowledged that they had conducted hacking, but pointed much more to China and non-state actors as a major source of hacking. He deflected any questions on Putin’s support for his candidacy. He said, in effect, he could handle Putin and hope to gain his cooperation, but would defend US and fight to protect American interests. As Trump defined it, a good personal relationship with the Russian President would be an asset rather than a liability. He also tweeted that he had no business interests in Russia. A good portion of the news conference was taken up by a Trump Organization lawyer outlining the means by which he was going to disassociate himself from conflicts by turning his assets over to his two adult sons! He said the US government defenses against cyberwarfare were weak under Obama and with the Democratic Party, and he would make government defenses strong. Just how was not stated except he would bring in the best people. But as we have seen over the last two years, much of his statements were vague and discombobulated even contradictory. He did not really answer many of the questions asked. He mostly made a pitch of why he was so great and all would be just wonderful and repeated many of his slogans from the campaign and tweeter posts. There were almost no specifics on many key issues except he still held that Mexico would pay for the wall and hinted at taxes against Mexico, but the wall would start without money from Mexico. Trump justified this change by noting he wants to begin construction immediately and not wait “a year and a half” to conclude negotiations with Mexico first. Nuclear issues and climate change were largely ignored to the detriment of the conference providing insight on these issues as nuclear security is one of the critical issues for our nation and world and the same can be said about climate change. Hang on to your hats readers this is going to be a difficult four years. The comment section can be found here or below.